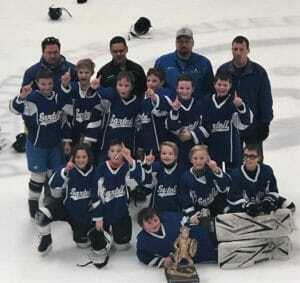 The Sartell Sabre Peewee A team competed in the Edina Tradition Invitational. During pool play they defeated Madison 8-1, Minnetonka 2-0 and Eagan 3-1 to advance to the championship game against the host team Edina. They fell short after a hard- fought third period with a final score of 3-2. The tournament was Dec. 27-30. Sartell Squirt B White team members are (front) Jake Ashby; (second row. left to right) Brady Anderson, Luke Webster, Landyn Stavos, Cade Budde and Ben Marushin; (third row) Keaton Landowski, Brayden Klande, Kaden Peterlin, Isaac Menzter, Nathan Gjemse and Landon Kimble; and (back row) coaches Travis Peterlin, JD Anderson, Tom Gjemse and Pat Marushin. 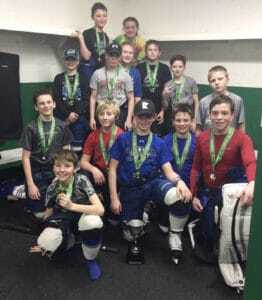 The Sartell Squirt B White team won the Wayzata Freeze Squirt B1 tournament during the weekend of Jan. 4-6. In the Jan. 4 game against STMA B1 Gold, Sartell won 8-5. On Jan. 5, Sartell hung on to beat Blaine 3-2, getting the winning goal with under two minutes left. In the championship game, Sartell earned a 6-2 win over Andover. Gabrielson Law Office has been accepted as one of the American Institute of Personal Injury Attorneys 10 Best Law Firms in Minnesota in client satisfaction for 2018. The American Institute of Personal Injury Attorneys is a third-party attorney rating organization that publishes an annual list of the Top 10 personal injury attorneys in each state. Ten Sartell students have been named to the fall dean’s list at the University of Minnesota Duluth. To qualify for this honor, students must achieve a minimum grade-point average of 3.5. The students are: Bret Burggraff, Laurana Deuel, Rachel Eisenschenk, Wyatt Hill, Nicholas Johnson, Kevin Krauel, Nathaniel Miller, Danny Nguyen, Alayna Paulsen-Trombley and Trevor Raths. Kerry Ashfeld of St. Stephen has been named to the president’s list at Central Lake College, Brainerd. To qualify for this honor, a student must maintain a minimum grade-point average of 3.75. Twenty Sartell students have been named to the fall semester dean’s list at North Dakota State University, Fargo. A student must earn a minimum 3.50 grade-point average to qualify. The students are: Peter Amundson, Amanda Burge, Jonathan Carlson, Arianna Christian, Dawson Coleman, Courtney Deters, Jessica Deters, Ryan Dumont, Ryan Fernholz, Alyssa Frank, Benjamin Grant, Morgan Grasswick, Callie Grosz, Michael Heim, Samantha Killmer, Bailey Offerdahl, Macy Senn, Kirk Staiger, Sydney Thieschafer and Benjamin Yelle. Sophie Loberg, daughter of Dawn and Jeff Loberg of Sartell, was named to the fall semester dean’s list at the University of Minnesota. She maintained a minimum 3.666 grade-point average to earn this honor. Hannah Yackley of St. Stephen was named to the fall semester dean’s list at the University of Wisconsin-La Crosse. To be eligible for this honor, a student needs a minimum 3.5 grade-point average. Five area students have been named to the fall semester dean’s list at Minnesota State University, Moorhead. Students must maintain a minimum 3.25 grade-point average to qualify. The students are Mikayla Gessell, Kia Grindland, Rhett Staiger and Nathan Stracke, all of Sartell, and Tessa Schwinghammer of St. Stephen. Six area students recently graduated from the College of St. Scholastica, Duluth. They include the following local students: Emily Crilly, Jessica Eisenschenk, Andrea Johnson, Jodie Lieser and Chelsey Mersbergen, all of Sartell, and Maggy Hiza of St. Stephen. The Knights of Columbus Bishop Trobec Council No. 5276 conducted a free-throw contest on Jan. 12 At. St. Francis Xavier School. Boys and girls between the ages of 9 and 14 were invited to participate. 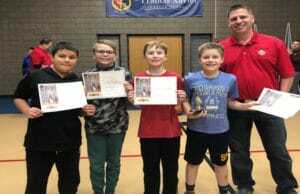 There was a boy and girl winner in each age group and they will advance to the district level at St. Francis on Saturday, Feb. 9. Free throw participants (left to right) Devin Lawson, Grant Kurowski, Tyler Thole, Brady Thompson and Grand Knight of the Bishop Trobec Council No. 5276, Dan Kurowski. Four Sartell students were recently named to the fall dean’s list at Iowa State University, Ames. Students must earn a minimum 3.50 grade-point average to achieve this honor. The students are: Taylor Buske, Anna Ellis, Seth Daniel Jenkins and Jordan Och. Four Sartell students graduated in fall 2018 from North Dakota State University, Fargo. They are: Amanda Burge, Ryan Dumont, Michael Heim and Michael Kutz. Dumount and Heim graduated with honors after achieving a grade-point average of 3.50 or higher. Austin Sura of Sartell has been named to the fall dean’s list for outstanding scholarship at the University of Notre Dame (Indiana) College of Engineering. Students who achieve this honor represent the top 30 percent of students in their college.